Construction photos from the expansion to New Belgium's packaging hall to accommodate their customers with the flexibility of craft beer in cans. The building expansion was designed to operate a few days a week originally and had many sustainable features to be able to shut down the space when not in use. Bright beer vessels were originally part of the fermentation cellar. 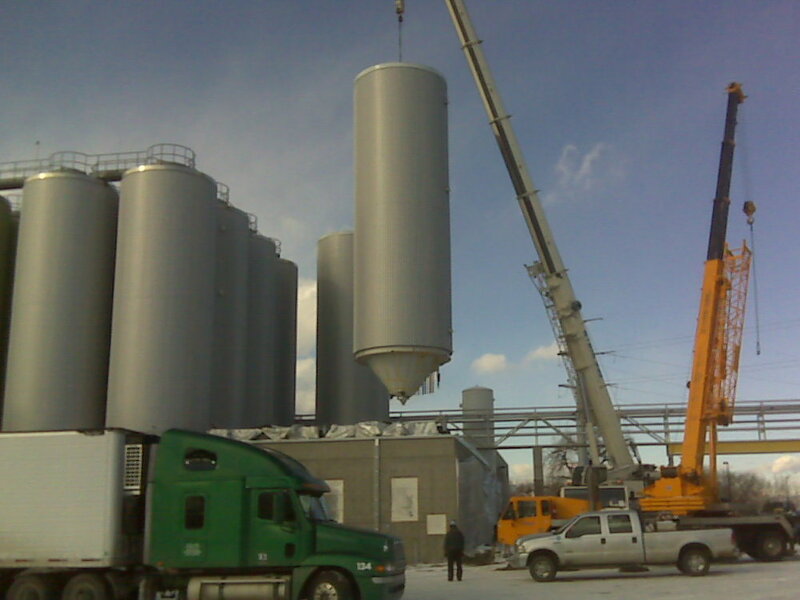 This project relocated the existing BBT's out of the cellar and placed them outside on supporting legs that freed up room for more fermenters inside the building. This project relocated three existing and three new BBT's. In 2014 we expanded both the fermentation cellar with 12 more 2200 HL fermentation vessels and four more 2200 HL bright beer cellar at the Fort Collins facility. This type of cellar an "egg crate" design, based on building a structure that acts as the egg crate to support roof mounted fermenters. The cone is accessible inside the building and the tank is jacketed and clad to be exposed outside the building.